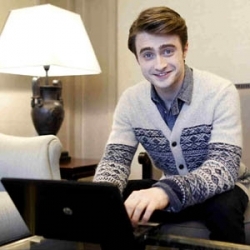 Daniel also took time to talk with the press in Madrid to promote The Woman in Black. El País has published their half hour 'digital interview' online with a picture of Daniel chatting with their readers on a laptop. Read that below. How did you felt about your past nines and teenage years after filming. Did you not feel the lack the time to enjoy your life? In all, I had a young fanstastic, strange, but healthy and great time. The Woman in Black is a ghost movie, but what fears Daniel Radcliffe? crocodiles and large volcanos. If Yellowstone errupts.. Were you afraid to shoot some part of the film? Were they worse then some scenes of Harry Potter? You rarely create fear when you are shooting. There were a couple of moments where I was scared. The Black Woman, but in real life much more intimidating is Ralph Fiennes. Do you think this new film will give you more films offers in the near future?? I hope. I do not aniticipate but I think that when people see this film that they will realise I have more to offer. Hello Daniel, Do you have any regrets in your career? No, I learn from every mistake.. if I had made some. Hello! What's your favorite part of the series? and why? greetings! The fifth part of the movie and books. because it emphasizesthe serious part of the character. Would you date or have you ever been dating a fan? No, I never did., But I appreciate the love from fans: it can not be the starting point of a relationship. How did you prepare to spice up your character? Considering you had so much spice to a lawyer as a father. I concentrated more on reflect their grief over the loss of his wife. I talked to some friends about depression. Lucky that I have my real life is positive. And I could make my role more believable father watching my relationship with my father. Hi Daniel, I think you are a very talented actor. I would like to answer me a question: what would give us three reasons to go see black woman? Thank you very much and I hope you enjoy your visit to Spain. 1. - I imagine not scare far 2. - It's a good movie to watch with friends and you asustareis together. 3. - Is very different from the current horror. It's not about acting, but help in that regard. Came from my father: "When you meet someone, hits well in hand and greet him." It is a small but powerful act. Which Spanish actress you like to work in a movie and that the style you would imagine (comedy, romance, adventure ...)? I know that is not Spanish, but Salma Hayek would be nice ... and of course Penelope Cruz. With either be happy. It was the best script I read, and I wanted to be part of history. I'll be happy if I get a comedy also in the future. Last night I saw you in "The Ant" and pleasantly surprised me. I thought you were a great guy: friendly, polite and with a certain candor. My question is: return to undress in a theater as you did in "Equus"?. We spent doing wrong?. Thank you very much and I hope you liked it when you came Valencia. It is likely that in the future I undress in film. It was very violent. I am 22 years and I feel comfortable with my body. And I liked the Valencia science museum! Would you like to re-run a series or movies prefer loose? I think I need a couple of years to go back to and engage in a series. But it always depends on the material, and if I feel close to it or not. What is your favorite part of Spain? Culture, literature, people, and as the English do not we have stuck with you over the past 200 years, we can get along. And I like that journalists here and in Canada are very few invasive of privacy. Is it hard to see reflected every year of your growth in a character that is not you? Excellent question, and scary. I do not check the movies. But in a way it's funny that you have a record of all your childhood ... and I remember seeing them what happened that day on the set. Have you now more projects planned? Thank you all for your questions, very interesting, and I hope to see you soon.